“As a young man, he wrote the figure of the Force among those Virtues that were written on the tree of Antonio and Piero Pollayolo for the merchant shop in Florence” Vasari. In accordance with the cultural notions characteristic of Florence, Botticelli wrote a figure embodying a moral force and conviction. Its outlines are clearly delineated, clearly highlighting plastic volumes; Apparel quietly falls, forming wide folds, similar to those that we see in the sculpture of Verrocchio. This sculptor Sandro follows in the understanding of the relief of form, as well as in the careful jewelry decoration of the throne. But at the same time, his “Power” is far from the expression of masculine energy. Although the figure sits on a deep throne, its instability is felt in its pose, and the slightly wistful inclination of the head and hands nervously touching the arms reveal the internal fragility of the image. In this work, the influence of master Antonio del Pollaylo is traced. Carefully traced chased armor gives a deep knowledge of the master in jewelry art. The figure on the throne is full of energy and life, in her face and pose one feels that individual manner of Botticelli, which made a deep impression on his contemporaries and brought a new twist to the Italian art of the Renaissance. 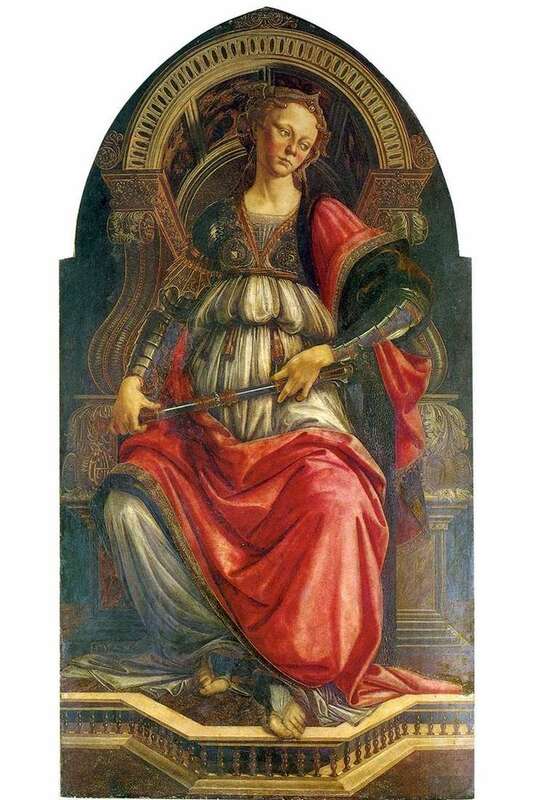 Description and meaning of the painting Allegory of Strength (Fortitude) by Sandro Botticelli.